Giving to Eden not only helps the seminary thrive into the future but it can also help you accomplish other financial planning goals. Here are some ways you can financially support the seminary. If you have any questions or would like to talk through the different options, our Director of Development Sandi Lafata will be happy to be in touch with you—call 314-918-2691 or email [email protected]. This is the simplest and most direct way to show your support for Eden. Planned gifts may allow you to make a gift beyond your expectations while also gaining tax advantages and other benefits. Look through some of the options below to see if they may be right for you. You may leave a portion or all of your estate to Eden. This can provide a significant gift to the seminary while ensuring a charitable estate-tax deduction. Our Office of Institutional Advancement can discuss specifics with you and your financial planner. You may chose to list Eden as the beneficiary of your retirement plan, life insurance policy, bank or brokerage accounts, charitable annuities or trusts, or charitable lead trusts. Distributions to charities via beneficiary designations are not subject to tax or probate. Many employers offer to match the charitable contributions of an employee, raising the power of your initial gift. Talk with your human resources office to see if your company participates in this program. Appreciated stocks and securities can provide Eden with financial support while providing you a tax advantage. Gifts of stocks and securities may be deducted at full market value on the date of transfer to Eden, and if those stocks have been held for one year or longer, they are deductible up to 30% of your adjusted gross income. Capital gains taxes are not owed on appreciation of the asset when the property is sold by the seminary. For more information about listing Eden as a beneficiary of a financial plan, contact Director of Development Sandi Lafata at 314-918-2691 or [email protected]. Endowment gifts invaluable to Eden. These gifts consist of a collection of individual funds that are invested and managed by the seminary. These types of funds provide fiscal security and a reliable income for Eden. We work with donors to determine how the fund may be used so that it stands as a tribute to the donor’s values and vision in addition to their generosity. These scholarships allow donors to recognize and support students who reflect their values and experiences, such as denominations, backgrounds, and even hometown region. Access to these scholarships can be the deciding factor in whether a student can pursue their call to ministry. 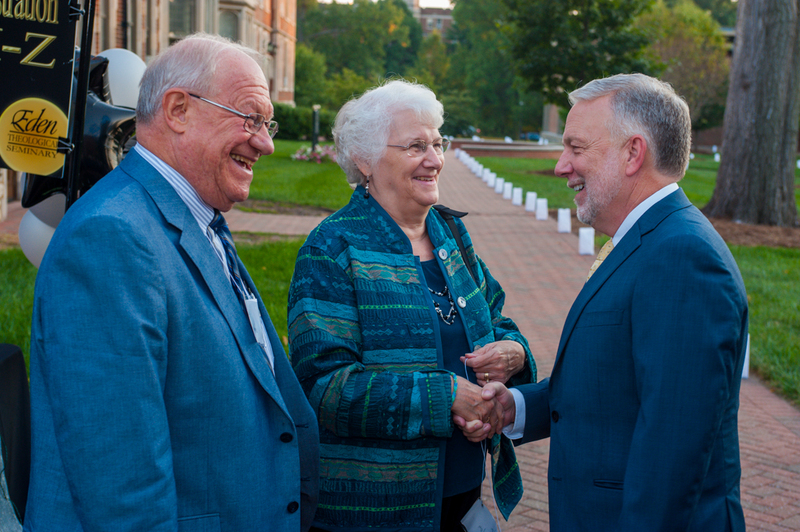 Endowed chairs are a tremendous honor for faculty. It represents a prestigious professional recognition from their colleagues and community. There are currently seven endowed professorships at Eden. Endowments can also be established to support specific facilities or programs close to a donor’s heart. Examples include the Scholin Endowment for Music Education and the Bailey Seminar fund. Donations of any size may be made to Eden’s Cloud of Witness annual scholarship fund that provides financial aid to any enrolled student. Gifts can also be designated to students from a specific denomination, including United Church of Christ, Christian Church (Disciples of Christ), United Methodist, Presbyterian Church (PCUSA), and more.